CELEBRITY HUB: Madhuri Dixit headed for divorce? Madhuri Dixit headed for divorce? 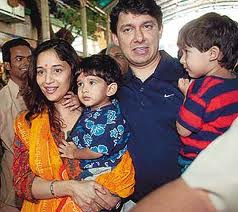 Madhuri Dixit IS Not Happy With Hubby Shri Ram Nene? Bollywood actress Madhuri Dixit shifted to the US after getting married to Shriram Nene in 1999. Since then, she has been settled in the US and giving priority to her family that includes two sons, Arin and Ryan. She has reportedly started looking out for schools in India for her sons. Madhuri has kept away from Bollywood over the last few years and her comeback in 2007 in Aaja Nachle bombed at box office. Now it seems Madhuri wants to focus back on her career. She has even started receiving offers from lot of producers. It seems it’s a fresh start for this dancing diva Madhuri Dixit.